Coinciding with Father’s Day in the UK and the US this Sunday, our Discovery Friday plays homage to father figures. ‘Discovery Fridays’ is our sister version of beryl’s Newsletter ‘Find & Share’ – a space where we share what caught our attention. If you’d like to receive a selection of urban cycling, cities, design and technology stories related to cycling and living in cities, you can subscribe to our newsletter in the footer of this page. We only share stories we’d like someone to share with us. Like the ones below. Fred Wright is one of the UK’s most promising track cycling young talents. His dad, Phil, a British actor, has been supporting his son’s career “since Fred was three”, accompanying him at the iconic Herne Hill velodrome every week – check out his pictures on Instagram here. We were lucky to meet both and let them be dad and son while taking a few pictures around their neighbourhood in Dulwich, South London. Fred had just returned home for his 19th birthday from Manchester were “he’s studying the art of cycling”, as dad Phil put it, at the National Cycling Centre. Happy birthday, Fred, and happy Father’s Day, Phil. ↑ Fred and Phil Wright. Like father, like son. This beautiful Dutch film made by Michaël Dudok de Wit won the 2000 Academy Award for Animated Short. Featuring a daughter and her dad. And lots of bikes. One of our favourite father-daughter duos are Glastonbury festival Michael and Emily, supporters of cycling and sustainable lifestyles. Here’s a curated Glasto playlist to enjoy with your dad while you both wait for next year’s edition. Play it loud. To commemorate dad’s day, we pay tribute to all the innovative bicycle designers and engineers behind the bike throughout history with this OU documentary. Fred and Phil Wright are among the most illustrious cycling dad and son/daughter tandems. Rouleur magazine has put together a comprehensive list of other extraordinary cycling dads and their offsprings. See it here. 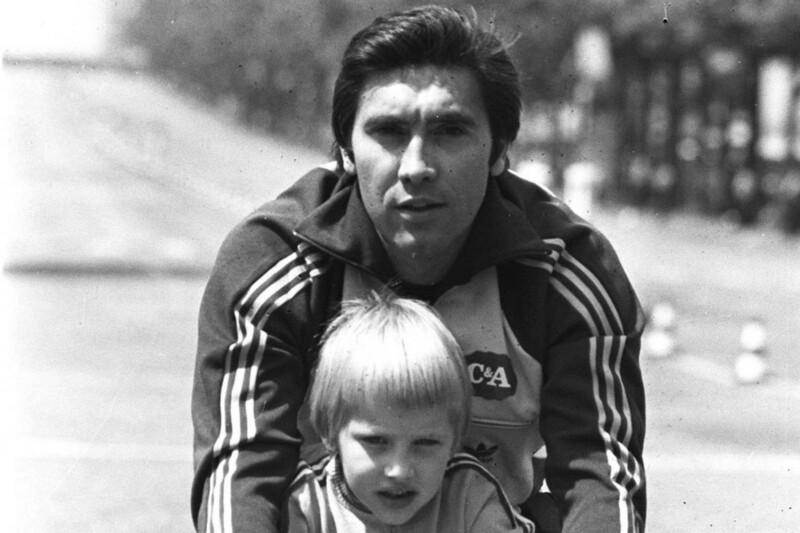 ↑ Eddy and Axel Merckx.